Original Airplane pencil hand drawing made by early Aircraft Designer Randolph Fordham Hall. The drawing was also signed by him and dated June 7, 1924. 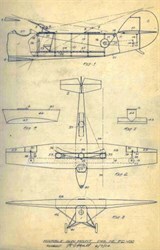 The document has three different drawings of an early monoplane aircraft; one from a top angle and one from a side angle, and one from the front. At the bottom of the drawing it says "Movable gun Mount" DWG No PD-100 (signed by )inventor R.H. Hall. This drawing was used for one of Hall's many patents while he was working for the Thomas Morse Aircraft Corp.